Wow, I looked at the sports reports this morning and one ESPN writer asked “What now for Alabama”? Really? I mean, I’m a Big Ten homer but even so, I have to say that Alabama will be just fine…three championships in four years is incredible! This year they get beat by a very good Auburn team; even then it takes a last second play. Last night they lost to another good team. 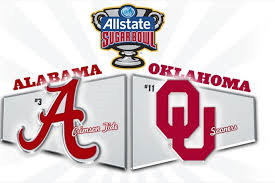 In this year’s Sugar Bowl Oklahoma was a 17 point dog, Mark May predicted a 48-10 blowout by the Crimson Tide and no one outside of Norman gave them a fighting chance. So, how did this happen? Is the Earth spinning the wrong direction? Is the sky falling? No. The last time I looked, every FBS team fields scholarship athletes on both sides of the ball…the best 18-22 year old players from all across this land! Last night the Sooners were the best team on the field; they fought harder and the play-calling was near genius. I don’t know about you, but I’m a little tired of ESPN, CBS, and the other network pundits continually talking about one conference vs. another for sports dominance, or deeming a program a failure after a loss or two. I’m a football fan and can appreciate talent no matter if they wear the Maize and Blue, Crimson and White or Scarlet and Gray. I love the game and enjoy watching these athletes perform at a level I could only dream of. No matter what trends or statistics the media focuses on, these kids come to compete – and anything can happen on the field. That’s why they play the game and why I’ll keep watching college football! This entry was posted on Friday, January 3rd, 2014 at 1:33 PM	and tagged with Alabama, Crimson Tide, Oklahoma, Sooners and posted in College Football, John Ely Blog, Sugar Bowl, Uncategorized. You can follow any responses to this entry through the RSS 2.0 feed.